When Baxter invites the old gang to participate in his new restaurant's gala opening in San Francisco, Savannah looks forward to seeing her friends, and even asks Brooklyn to restore a tattered cookbook—an old gift from Baxter—as a present for him. But Brooklyn immediately recognizes that the book, which has strange notes and symbols scrawled in the margins, is at least two hundred years old. She thinks that it probably belongs in a museum, but Savannah insists on returning it to Baxter. Shortly after receiving the gift, Baxter is found dead, with Savannah kneeling over him, bloody knife in hand, and the rare cookbook has disappeared. Brooklyn knows her sister didn't kill him, and she suspects the missing cookbook might lead to the real villain. Now Brooklyn will have to turn up the heat on the investigation before Chef Savannah finds herself slinging hash in a prison cafeteria. "Carlisle keeps the suspense high as Brooklyn sleuths her way through a host of chefs and other suspects to the satisfying resolution." "The descriptions of the meals are luscious and the history of the book intriguing." "Carlisle cooks up a great whodunit in the latest Bibliophile mystery. Brooklyn and Derek are back, with some new friends, to solve quite an interesting caper. With a wealth of entertaining characters and fascinating facts on bookbinding thrown in, it's a winner!" "Another superb entry—and this one is succulent as well—in Kate Carlisle's witty, wacky and wonderful bibliophile series. Quirky characters and an intriguing cookbook with a fabulous history add to the fun. Highly entertaining." 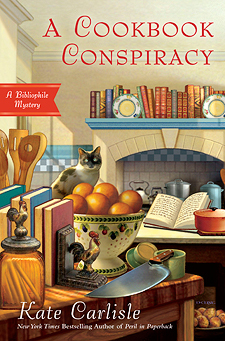 "Everyone's favorite bibliophile, Brooklyn Wainwright, is back in A Cookbook Conspiracy. A delicious, twisty tale, it features food, friends, fiends, and a mysterious antique cookbook that binds them all. Kate Carlisle's most delectable installment yet. Don't miss it!"